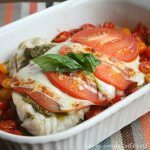 This grouper caprese is a simple seafood recipe made with grouper, fresh tomatoes, pesto, and mozzarella. Lightly salt and pepper Grouper and then pan fry, 2 minutes each side. Place fried grouper on a baking sheet. Smear each piece with pesto, then top with 3-4 thinly sliced tomatoes, and sprinkle with grated Mozzarella cheese. Bake grouper in the oven for 8 minutes.